Authorities in Montana say that the man was wearing camouflage clothing and standing on a highway when he was struck by two vehicles. 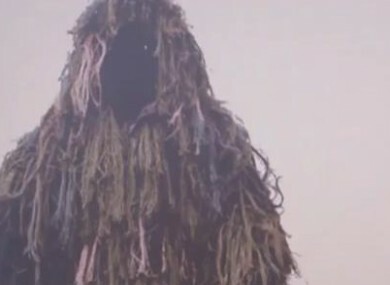 An example of the 'ghillie' suit clothing worn by the man. A MAN DRESSED in a military-style “ghillie” suit and apparently trying to provoke reports of a Bigfoot sighting in northwest Montana was struck by two cars and killed, US authorities said. The man was standing in the right-hand lane of US Highway 93 south of Kalispell on Sunday night when he was hit by the first car, according to the Montana Highway Patrol. A second car hit the man as he lay in the roadway, authorities said. “He probably would not have been very easy to see at all,” Schneider told KECI-TV. Email “Big Foot hoax attempt ends with man's death”. Feedback on “Big Foot hoax attempt ends with man's death”.